Between 2012 and 2013, the amount of money invested globally in climate change mitigation and adaptation dropped by $28 billion. At a time when scientists say we need to start seeing a dramatic surge in zero-carbon energy sources, the drop seems like bad news. It's certainly not good by climate action standards. But it's not as bad as it sounds, either. 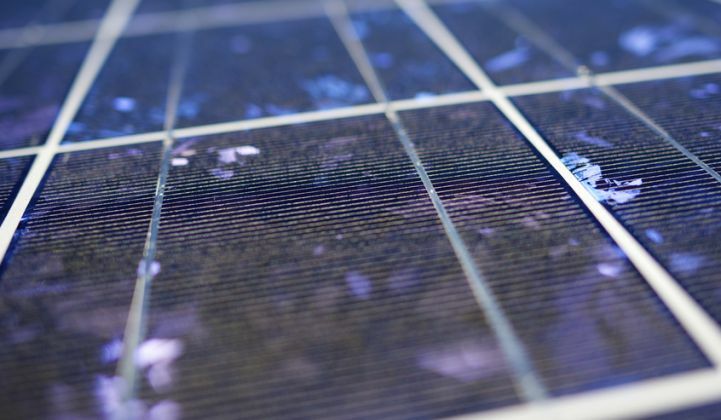 According to a new report from the Climate Policy Initiative, the decrease in global climate finance can be largely attributed to the year-over-year drop in the cost of installing solar PV. "The overall decrease is mainly due to the falling cost of some renewable energy technologies, particularly solar PV. These cost savings mean that in some cases, more renewable energy is actually being deployed for less investment. In 2013, it cost USD $40 billion less to achieve the same level of solar deployment as in the previous year," wrote the authors. Last year, global private investment in renewables amounted to $193 billion, which is $31 billion lower than in 2012. A decrease in wind power development partly contributed to the negative change. But the most influential factor was the lower cost of solar PV -- accounting for 80 percent of the drop. As the chart below shows, the solar industry saw a $19 billion dip in investment in 2013 compared with 2012 levels, even while deploying 5 gigawatts more capacity than the year before. In 2012, 32 gigawatts of solar PV were installed around the world, according to the European Photovoltaic Industry Association. The following year, 37 gigawatts were installed for tens of billions of dollars less. 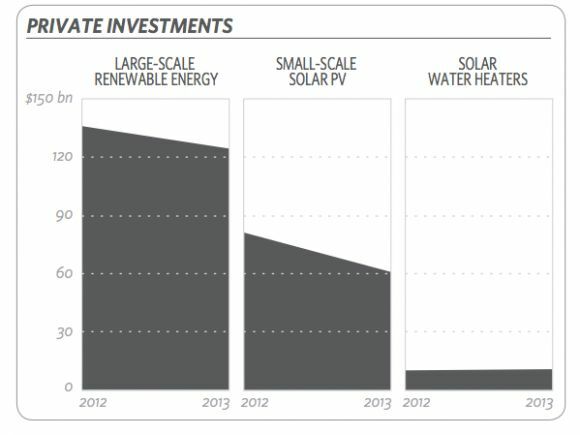 Earlier this year, Michael Liebreich, founder of Bloomberg New Energy Finance, described the dynamics that contributed to the change: “A second successive year of decline in investment will come as unwelcome news to the clean energy sector, but the top-line figures don’t tell the whole story. Investment in Europe crashed, in large part because of the falling cost of solar installations, whose volume worldwide actually grew by around 20% to a new record." The numbers show the stunning yearly improvements in solar's economics. However, the authors warn that solar is only a small part of the climate finance picture, which includes support for clean transportation, efficient buildings, and resiliency projects that protect vulnerable communities from rising sea levels. When factoring the many areas of climate finance together, the authors of the Climate Policy Initiative warn that the "situation remains grave." Last year's $331 billion in low-carbon investment was roughly one-third of what the International Energy Agency says is necessary each year until 2050 in order to prevent global average temperatures from rising more than 2 degrees Celsius. "In cumulative terms, the world is falling further and further behind its low-carbon and climate-resilient investment goals," concludes the report.